An antique porcelain bowl found during a house clearance on the Isle of Man has sold for over half a million pounds, despite the opening offer being only £10,000. The decorated porcelain jardiniere attracted bidders from all over the world, with London’s three-biggest Chinese art dealers flying to the island for the auction, and telephone bidders calling from as far afield as Hong Kong. 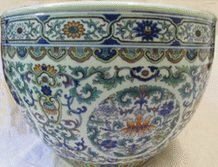 The bowl, a Qianlong planter with Doucai decoration, was found in the attic of a deceased estate as part of a house clearance. It was listed for sale by Murray’s Auctioneers in Douglas on the Isle of Man, where it generated huge interest. The estimated price before the auction was between £40,000 and £60,000, although the bidding quickly rose to £300,000 – before a London-based art dealer offered half a million from the floor. He was outbid by a dealer on the phone from Hong Kong, who put in what was to become the winning bid of £520,000. This case is just one of many that has had people up and down the country rummaging around their attics in the hope of finding an antique treasure.